Pure-play 3D printing stocks had another terrible year -- with one exception. 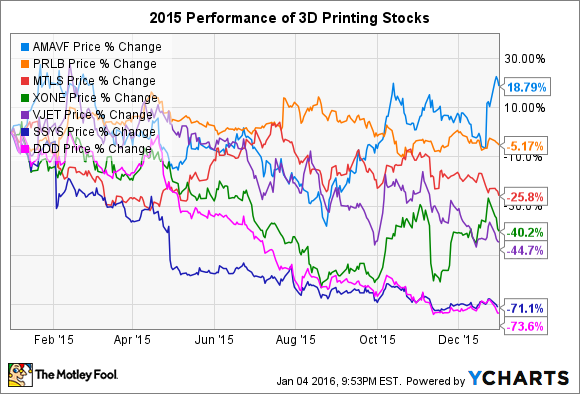 Here's why the best 3D printing stock of 2015 outperformed. The 3D printing stocks in general posted their second consecutive terrible year in 2015. Taken together, the two-year period has been pure carnage in the space, with the stocks of industry leaders 3D Systems (NYSE:DDD) and Stratasys (NASDAQ:SSYS) losing 91% and 82%, respectively, of their value. Arcam, founded in 1997, makes 3D printers that use its proprietary electron beam melting (EBM) technology to produce metal components. It targets customers in the medical implant and aerospace industries. Arcam's two acquisitions in 2014 -- AP&C and DiSanto -- extended its operations beyond Sweden. Canada-based AP&C produces metal powders, while Connecticut-based DiSanto is a contract manufacturer of orthopedic implants. Arcam's stock is listed on the Nasdaq OMX Stockholm, though it can also be bought over the counter in the United States. In part because of its foreign listing, Arcam is very thinly traded, which means it can be especially volatile. 1. Better management execution than the other pure plays. Arcam's management's execution was good on an absolute basis, and even better on a relative basis. Stratasys' management was largely at fault for the MakerBot implosion by releasing the fifth-generation Replicator before it was ready for prime time; 3D Systems' execution lacked considerably, as evidenced by several product quality issues; and industrial specialist ExOne has missed its own revenue targets in every period since it went public in February 2013. 2. Focus on metal 3D printing. Arcam's sole focus on metal 3D printing helped it in two ways. First, metal 3D printing is the fastest-growing space within the 3D printing industry. Second, metal 3D printing is newer than polymer 3D printing, which helped Arcam avoid the industry overcapacity issue that plagued both 3D Systems and Stratasys in 2015. Additionally, its metals focus should help it in another way in the future: It will better insulate it from the compelling competition from HP Inc. and well-funded start-up Carbon3D that's expected to come to market in 2016. Both companies plan to release super-speedy polymer 3D printers for the enterprise market. 3. Technology is entirely proprietary. Arcam's technology is patent-protected, so any entity that wants a 3D printer that uses EBM technology has to buy it from Arcam. This makes it less vulnerable to competition. This isn't to say that Arcam doesn't have any competition, as direct metal laser sintering (DMLS), which is the most widely used metal 3D printing technology, competes to a good extent with EBM. Each tech shines in certain applications, whereas they compete more directly in others. Arcam's acquisition of orthopedics player DiSanto helps it grow vertically. Image source: Arcam. 4. Focused and synergistic approach to acquisitions. Arcam's two acquisitions have enabled it to become vertically integrated. AP&C guarantees that Arcam will have a readily available supply of high-quality titanium powder to provide to those buying its EBM systems. Additionally, it allows Arcam to profit from the industrywide growth of metal 3D printing, as AP&C sells powders to other companies, too. DiSanto should help Arcam expand the market for its 3D printers. The more orthopedic-implant contract-manufacturing business DiSanto generates, the more systems it will need to acquire from its parent company. This focused and synergistic acquisition strategy is in stark contrast to the seemingly shotgun-like approach that 3D Systems has employed for numerous years, which is one huge reason for its implosion over the last two years, in my opinion. Stratasys hasn't been nearly as guilty as Triple D on this front. However, its purchase of the beleaguered MakerBot is in contrast to Arcam's acquisitions with respect to impact on earnings. Arcam's acquisitions were accretive to its earnings relatively soon after it bought the companies, whereas MakerBot has been an anchor on Stratasys' earnings from the get-go. Arcam outperformed its industry peers in 2015 primarily because its top management team continues to execute the best among the pure-plays. Additionally, its focus on the more nascent metal 3D printing realm helped it to avoid the overcapacity issues that plagued those companies involved in the polymer 3D printing space.